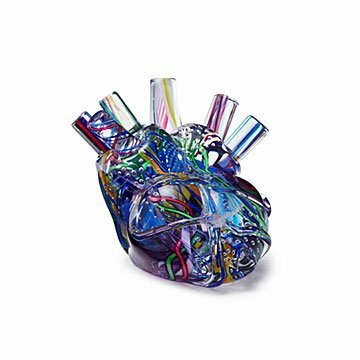 Glass blowing duo Alyssa Getz and Tommy Cudmore make these dazzlingly colorful heart sculptures by hand. The human heart is a beautiful thing, but we've never seen one that looks beautiful until now. Collaborating couple Alyssa Getz and Tommy Cudmore fell in love at glass blowing school, so of course they had to create a dazzling work of heart art together. They hand pull colorful cane through hot, recycled glass to make "veins" and "arteries." Thanks to its vibrant, surrealist look, it's an instant focal point and conversation piece, especially when sunlight passes through it. Each heart is one of a kind, just like the real ones. A wonderful gift for someone you love (especially if they're a heart surgeon). Handmade in Mississauga, Ontario. Alyssa Getz and Tommy Cudmore met in the Glass Blowing program at Ontario’s Sheridan College over 10 years ago, and have been working in partnership ever since. They’re known not only for their quirky, fun approach to their collaborations, but for their technique. Tommy’s organized and meticulous glassblowing style has made him an in-demand assistant some of Canada’s most well known glassblowers. Alyssa was awarded the Artist Fellowship from the Mississauga, Ontario Living Arts Centre for her exceptional portfolio and diverse technical accomplishments. Together, they make colorful, mesmerizing, unforgettable glass art. I gifted this to a friend of mine who is a doctor. He loves art and absolutely loved the heart for many reasons. The wondrous heart is on my coffee table, on a flat round table. I printed out actual diagrams for the little kids to learn from.